"On the first day God created horses. On the second day He spotted the best ones". Situated in Masterton, in the picturesque Wairarapa, we are a small horse stud with a particular interest in Miniature Appaloosa horses. We have a small herd of gorgeous mares and our beautiful stallions, Thornhill Double Six Domino and Pinehaven Addicted To Love. Our horses were chosen for their beautiful temperaments and conformation, some have had outstanding show careers, and some have been chosen for their quality bloodlines, or, all of the above. After having large horses for most of my life, I acquired one of these wonderful little horses in 2006. Then, as you are probably well aware, one grows into two, two into three and so on! I bought my first Appaloosa (full size) way back in 1981, so my affection for these coloured beauties goes back a long way. 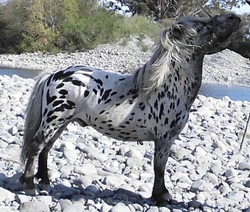 It wasn't rocket science to gel my more recent interest in the miniature horse together with the Appaloosa, hence my absolute love of the Appaloosa Miniature Horse. I am extremely passionate about the Appaloosa horse, whether it be full size or in miniature. They are highly intelligent, very obliging and they know they are beautiful! If you treat them right they will do anything you ask of them, if you don't treat them right they won't forget! Try one for yourself, you will never be disappointed.